This is a new one. I had to put the Windows rig back together (sacrificing my Linux rig) so that the wife could do some stuff. 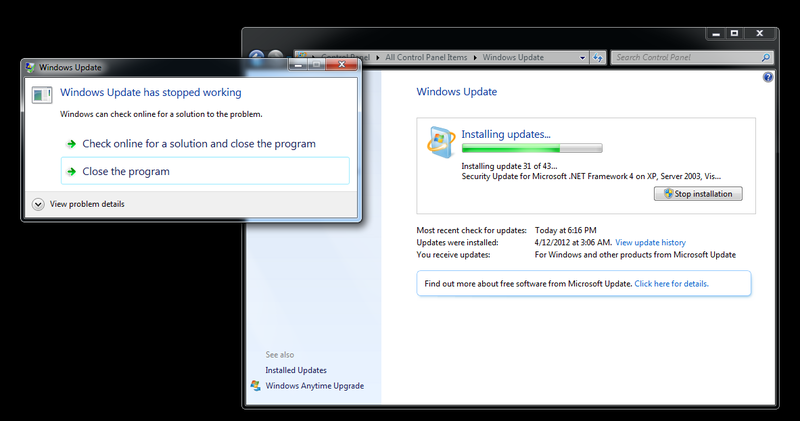 Since it had not been up since April I decided to update Windows. I got an error message in the Windows Update program that said something like “Windows update service isn’t running”. The Services settings says it’s running, so what gives? The fix (after much forum searching) is to go to the Windows Update settings and set it to “Never check for updates” and then back to “Install updates automatically”. That somehow bounced it back to a functional state. You don’t even have to click “Ok” in between – just select one option and then the other.